How do hamsters see and hear the world around them? Can they even see their owners and other animal companions? 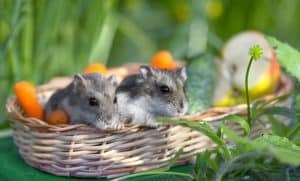 Many hamster owners ask this question, as the information can help them to keep their pets safe and cared for in the very best way. You might not be surprised to learn that hamsters have poor eyesight. What may astound you, however, is just how diminished their sense of sight is. Fortunately, they are not left without any sense of awareness. Their extraordinary sense of hearing compensates for their lack of sight. The near-blind state of hamsters means that owners must practice caution when caring for the animal. The sensitivity and physical fragility of their ears also mean that their advanced hearing should be considered when making noise in the vicinity of a hamster. When you understand a hamster’s senses, you are less likely to be confused or alarmed by their seemingly unusual behavior. When we better understand our animal friends, we’re able to protect them better and become more in-tune with their needs. This article will tell you everything you’ve wanted to know about your hamster’s senses of sight and hearing. At birth, hamsters emerge from the womb blind. This condition doesn’t get much better as they age, with the average adult hamster only capable of seeing a few inches in front of its nose. This may slow your hamster down, but it certainly doesn’t mean that they can’t enjoy a full, happy life with you. Why Do Hamsters Have Such Weak Eyesight? At night, a hamster’s vision improves slightly for the sake of helping them to locate food. In the full light of day, they are rendered almost completely blind. This is because hamsters are nocturnal, burrowing animals. Great eyesight isn’t necessary in the case of these animals living in their natural, wild habitats. Instead, they get by on their strong hearing, as well as their senses of smell and touch. How Can I Keep My Hamster Safe? Because of a hamster’s innate blindness, it is important to make special adjustments to their care. Multi-leveled cages are unsafe, as hamsters are unable to detect when they could fall. Never place a hamster, especially unsupervised, on an open surface that they could fall off. Similarly, they shouldn’t be placed on shoulders like some owners like to do. The hamster could become scared, jump off, or fall if mishandled. Injuries sustained from such falls can result in internal bleeding, broken bones and even death of your animal companion. How Can I Safely Get My Hamster Exercise? It is essential for the longevity and happiness of any animal to get an adequate amount of exercise. Humans must remember that hamsters are prey animals, however, and should handle them with care. This fact, combined with their poor eyesight, could lead your hamster to think your hand is a predatory bird. It could bite you in its attempt at self-defense. 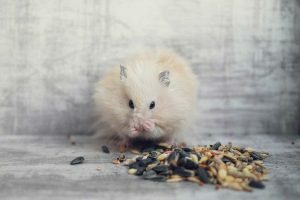 Dwarf Campbell Russian hamsters are especially high-strung in nature, meaning that you should definitely approach this particular breed with the utmost care. It could take them hours or even days to get accustomed to the sight, smell and feel of your hand. Siberian hamsters love to run and play the most out of all popular pet hamster breeds. Special care should be taken when arranging their play areas because they will go absolutely anywhere that they can. The best way to enjoy hands-on time with your hamster is to sit or lie on the floor. This eliminates their falling risk, which is the biggest risk associated with handling a hamster. The dwarf breeds of hamster require even closer supervision, as they are no more than a few inches in length and can easily become lost if left to their own devices. What hamsters lack in eyesight, they make up for with incredible hearing. Their ears are quite powerful, capable of picking up on frequencies unheard by human ears. This is an important aspect of their communication with fellow hamsters in the wild, as they will often address each other in these frequencies. Can Loud Noises Distress My Hamster? Because of the sensitivity of a hamster’s ears, it is best to avoid keeping them away from sources of loud noise. Barking dogs, squealing or crying children, or areas that face high-traffic roads could all cause your hamster distress. For this reason, it is best to enclose your hamster in a containment that’s away from loud noises. Loud children and rambunctious animals should be kept away from this space to minimize the risk of stressing out your pet. 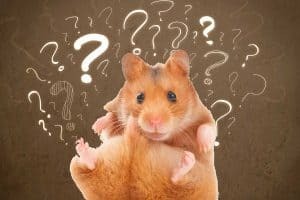 How Can I Tell if My Hamster Has Heard Something Unusual? Because hamsters can pick up on frequencies that human ears simply cannot, they may hear things that elude their owners. You may be able to pick up on their alarm if they stop suddenly and start sniffing the air. An unusual sound will prompt them to stop. They will usually continue to sniff the air in hopes of gathering more information. How Should I Talk to My Hamster? Like any other pet, you should talk to and engage with your hamster. However, it is best to keep one’s voice quiet. Whisper, if you can remember to, in order to avoid damaging their sensitive hearing or causing them to panic. A low, quiet voice is fine in general, as long as you don’t speak too closely into their ears. What Else Should I Know About My Hamster’s Ears? It is worth noting that the skin of a hamster’s ear is incredibly delicate. It can be torn or bruised easily, meaning that contact to their ears should be kept to a minimum. Concerning eyesight and hearing, which Hamster Breed Should I Adopt? All five of the popular household hamster breeds are adorable and make for great, fun-loving companions. However, they are not the “easy” pets that many people think they are. Because of their poor vision and extremely high-tuned hearing, you need to ensure that they have a safe and quiet space to exist in your home. Loud households are not the best fit for hamsters, nor are crowded and cramped households wherein they could easily become lost. The popular pet hamster breeds all have poor eyesight and excellent hearing, so this shouldn’t play a role in your decision. So what should you base that decision about? In addition to their unique senses, future hamster owners should factor in size to their decision. Dwarf hamsters are cuddly delights, but if they escape from your hold or from their cage, finding them again could be stressful and difficult. Syrian hamsters are the most popular household hamster for this reason (among others), as they can grow to half a foot long. Whichever breed of hamster you decide to bring into your home, you need to be confident that it is a space where they can comfortably live. Frequent handling and loud noises could make your hamster aggressive and fearful. If you are capable of creating the safe and stress-free environment that your hamster needs, you will find yourself overjoyed with their company – and they with yours. Hamsters are quite active and sociable creatures when comfortable.